Wooden snap traps are the best. Bait is not very important - location of the traps is far more important than bait. Place the traps directly where the mice are present, over the mouse droppings and trails. In the attic, set the traps in the insulation over the trails and tunnels they make in the insulation. Go ahead and bait the traps with peanut butter, or slim jims or chocolate. Don't use glue boards. They don't work well, and they are inhumane. There are many types of repeating multi-mouse catching traps. These can work okay when you have a huge infestation, but in my experience, are not better than the wooden snap trap. Live cage traps are pretty much worthless, because the high metabolism of the mouse means that it'll often quickly die from heat stroke, and if not, if you relocate it outside, without its attic home to live and hide in, a mouse will usually die within 24 hours. It's impossible to successfully relocate mice. You are sitting in your living room, minding your own business, when a noise overhead snags your attention. It is not a loud noise, not a thud or a crack, but a more subtly alarming sound: the sound of chewing. Most homeowners know what this noise means. Somewhere, somehow, mice have gotten into the attic. The primal fear humans have for tiny creatures that scurry incredibly fast beneath their feet only adds to the displeasure felt when mice are discovered in an attic. As soon as signs are there of a rodent invader, we go into mice-removal mode. What most people do not realize, however, is that mice in an attic can draw other, larger, creatures into a home. Squirrels, raccoons, and rats will kill an existing mouse population in order to feed on the available food supply. The mice need to go. Now. But how is this feat accomplished? Just how does one remove mice from an attic? Fire arms are not an option unless you want to start research on how to repair holes in your roof or sew back on your shot-off foot. Poisons are effective, sure, but what happens when a poisoned mouse keels over behind the attic wall, under the attic floorboard, or worse yet, gets eaten by a household pet? The smell of a decaying mouse carcass is almost as bad as the sound of a live mouse scampering overhead. 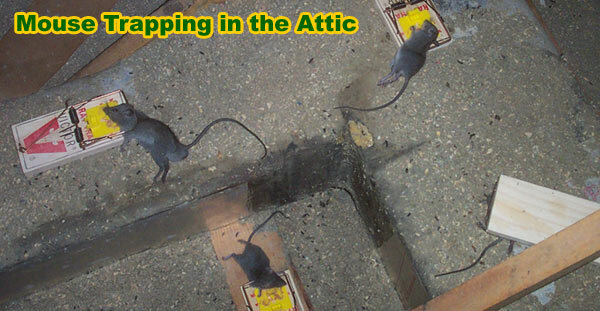 The first step for attic protection from mice is to locate a point of entry for the little monsters. It is very important to scan all areas for holes and gaps. Most mice can squeeze through spaces smaller than an inch. One unsealed hole will mean the continuation of infestation. Mice chew. That is what they do, and they do it well. Many substances cannot hold up against mice, but metal is a good option. If metal isn’t practical, pick a substance that is dense and would take time for a mouse to chew through. By monitoring these patched areas, you can determine if mice are trying to get back in. But there are still mice in the attic! No more can get in, but what do you do with those still there? It is now time to go to your local hardware store and buy some mouse traps. Many varieties of traps exist for mouse removal. Please keep the general code of humanity in mind when you select your mouse traps; there is no need to drown, maim, or make a mouse suffer through the last moments of its life. Lethal traps, like snap traps, will kill a mouse humanely. When all the mice have been dealt with, the task of cleaning begins. Any feces left behind will emit an odor that attracts other mice. Strange, yes, but that is a big part of keeping your attic mouse-free. Any trapped mice should be removed immediately. Please do not leave them around as a warning to other mice—it doesn’t work that way. Mice are everywhere. If you live in the country or city, you will encounter mice. Attics are prime locations for little rodents to gather. Most of the time, attics are warm, quiet, and unfrequented by the people who live in the household. Holes and duct work are ideal pathways for a mouse community to evolve. Stay diligent, keep your eyes open, and patrol your attics and crawl spaces in order to catch a mouse invasion before it takes over your home. Information about how to keep mice away - prevention techniques. This site is intended to provide mouse education about how to trap a mouse in your house or property and and information about mouse trapping, so that you can make an informed decision if you need to know how to keep mice away from the attic with trapping. This site provides many mouse control articles and strategies, if you wish to attempt to solve the problem yourself. If you are unable to do so, which is likely with many cases of mouse removal, please go to the home page and click the USA map, where I have wildlife removal experts listed in over 500 cites and towns, who can properly help you with your nuisance mouse. Click here to read more about how to get rid of mice.